For well over a century, academic disciplines have studied human behavior using quantitative information. Until recently, however, the humanities have remained largely immune to the use of data -- or vigorously resisted it. 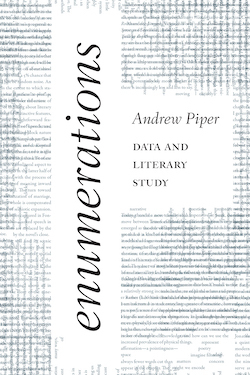 Thanks to new developments in computer science and natural language processing, literary scholars have embraced the quantitative study of literary works and have helped make Digital Humanities a rapidly growing field. But these developments raise a fundamental, and as yet unanswered question: what is the meaning of literary quantity? In Enumerations, I try to answer that question across a variety of domains fundamental to the study of literature. I focus on the elementary particles of literature, from the role of punctuation in poetry, the matter of plot in novels, the study of topoi, and the behavior of characters, to the nature of fictional language and the shape of a poet’s career. How does quantity affect our understanding of these categories? What happens when we look at 3,388,230 punctuation marks, 1.4 billion words, or 650,000 fictional characters? Does this change how we think about poetry, the novel, fictionality, character, the commonplace, or the writer’s career? In the course of answering such questions, this book introduces readers to the analytical building blocks of computational text analysis and brings them to bear on fundamental concerns of literary scholarship.